Q: What class do you have with Thompson? Q: How would you define your relationship with Thompson? Q: Do you go to Thompson for advice or just to catch-up? Q: Do you think other students have similar relationships like the bond you have with Thompson? Q: Has being close with Thompson affected your performance or experience in class? A: “I feel like if [Thompson and I] weren’t that close, I probably wouldn’t enjoy her class. I see other students that aren’t close with her and they hate the class because they’re like ‘We don’t understand why [Thompson] is this crazy,’ but if you know her that’s just who she is. Q: What are some instances that exemplify Thompson’s qualities that you described before? Q: How would you define Thompson’s personality? Q: What was it like being able to find someone like Thompson coming into freshman year? Q: Is there anything that you’d like the school to know about Thompson that typical acquaintances wouldn’t know? Q: How would you describe Smith’s personality? A: “He’s definitely very sarcastic. Q: How did you get to know Smith? Q: How has knowing Smith affected your social, academic and overall high school careers? Q: Do you think knowing Smith has improved your overall confidence? Q: What are some instances that exemplify Smith’s personality that you described before? Q: What are some things that those who are typical acquaintances with Smith wouldn’t know about him? Q: What differentiates your experience in Smith’s classes, where you’re close with the teacher, from others where you only know your teachers on a baseline level? Q: Have you seen Smith reach out to other students like he has with you? How does his openness translate with others? Q: If you were to write a letter to Smith about how much you appreciate him, what would you say? A: “It’s kind of a one-point word, but he’s very kind and caring, but at the same time he’s fun and enthusiastic and he cares about what he’s talking about, and he’s still engaged [when teaching even] after who even knows how long he’s been teaching, probably since the late 80s—who knows? He’s one of those people where he’s one in a million and you don’t find [many] people who are that great at being social…he’s great with people, but he doesn’t abuse it. Q: Do you have any instances or personal anecdotes that show how knowing Arthur has affected you personally? “I remember taking this test [over] conjugating [Spanish] verbs, but I had the flu and I was gone [the day of the test], but I had to take the test because I should have remembered [to study.] When I was sick, instead of studying, I was playing on a PS4 or doing everything but that. I come [back,] and I completely bomb the test. I [got] an F, the worst grade [that] I’ve ever had in my school experience. Some teachers I’ve had in the past, like in elementary [school,] have told me to ‘Shake it off. You should have studied’ or something like that. No, [Arthur] tried to make me feel [better saying], ‘See, it was probably because you were gone for [the test]. You still did good on these parts [of the test],’ and she tried to help me through that. I also applied for the C.A.R.E. program, so I used her for my letter of recommendation. Most people who get one from a teacher [think] ‘Okay, I need something, I’ll pick any teacher.’ I read through what [Arthur] said [in my letter,] and it’s not that she did the letter late, but had the audacity to text me like ‘Hey Ahmad, can I help you? I really want to help you with this [because] I think you’re such an amazing kid’ and all that positivity and stuff. Q: Has getting to know Arthur affected your overall academic experience? Have you become more open with other teachers by being more open with Arthur or have you only familiarized yourself with her? Q: Back to your letter of recommendation, did Arthur send it to you late because she was personalizing it for you? Q: How would you describe Arthur’s personality? The environment in her classroom? A: “She’s the type of teacher who sees when [her classroom is stressed,] so she’s the one to crack a joke. I’ve yet to go through an entire [Spanish] class without laughing or giggling from something she’s said. Q: Do you think other students have a similar relationships like the bond you have with Arthur? Q: Who is Clemens and how do you know her? A: “Mrs. Clemens and I have honestly not always been that close. I started eating lunch in [her classroom], and she had a couch—which makes life better—and we first started talking about schoolwork and stuff that I was struggling [with]. She offered to help me, and I had never had a teacher genuinely care and talk to me outside of class about something, so that really had an impact on me. I started going [to her classroom during] my [Alternating Unassigned Time or] whenever she would have her planning period. She helps me out with pretty much anything I need. [Clemens] gave us her phone number at the beginning of AP Lang, and I never actually used it until after I got out of her class. We get along so well, and we have the same sense of humor, and all I wanted on my birthday was a tweet from her because I just admire her. She talks all the time about how she feels like she ‘can’t adult right.’ Just getting an adult’s perspective on ‘adulting’ has given me more confidence in leaving Rock Bridge. 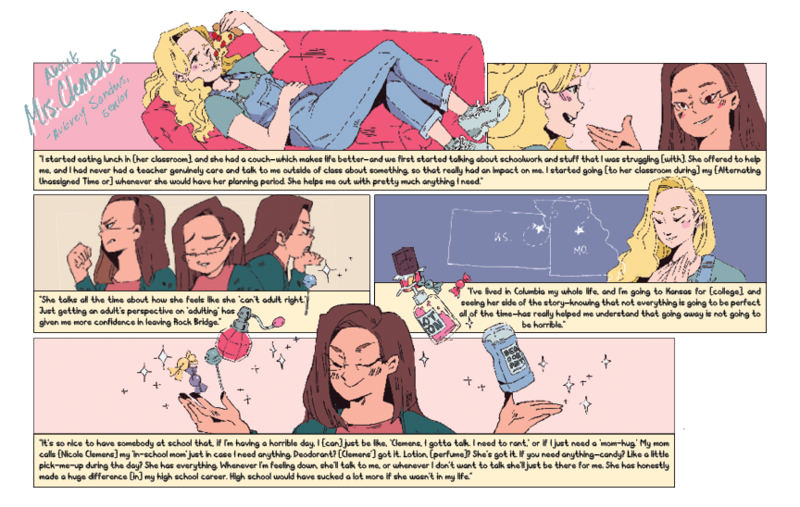 I’ve lived in Columbia my whole life, and I’m going to Kansas for [college], and seeing her side of the story—knowing that not everything is going to be perfect all of the time—has really helped me understand that going away is not going to be horrible. Q: How would you describe Clemens’ personality? Q: What are some instances that exemplify Clemens’ qualities that you described before? Q: Is there anything that you’d like the school to know about Clemens that typical acquaintances wouldn’t know? A: “I think that just because [Clemens] is slow at grading does not mean that she is not trying. She’s just trying to give you good feedback and actually cares about what your grades are. Q: Do you have any last minute comments about Clemens? Moy Zhong is a senior and the returning Art & Design Editor for The Rock and Bearing News. She oversees visual online and print production at Southside Media and eats copious amounts of fruit each day. This has great art! I agreed with a lot of the things they liked about their teachers.